Names: Sitka Spruce is another one of our giant conifers. Sitka is the name of a Tlingit tribe, and is also the name of a city in southeastern Alaska. The species name sitchensis is derived from Sitka. 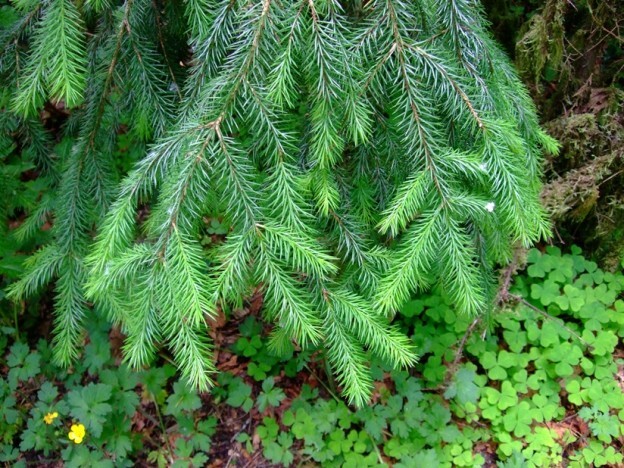 Relationships: There are about 40 species of spruce world wide, seven in North America. 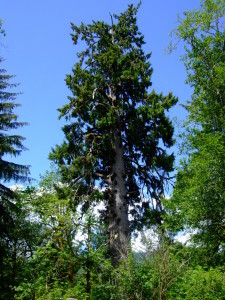 The Engelmann Spruce, Picea engelmannii, is commonly found on the east side of the Cascade mountain crests in subalpine forests. 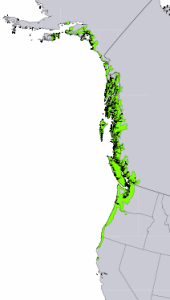 Distribution: Sitka Spruce is mostly found along the moist coasts of southeastern Alaska, south to northern California. It lends its name to the Picea Sitchensis Ecological Zone, a long narrow zone that stretches along these coasts. It is distinguished by frequent summer fogs and proximity to the ocean. 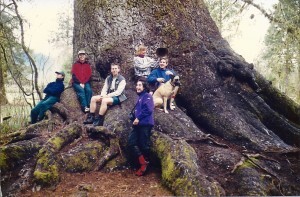 The Largest Sitka Spruce near Lake Quinault. 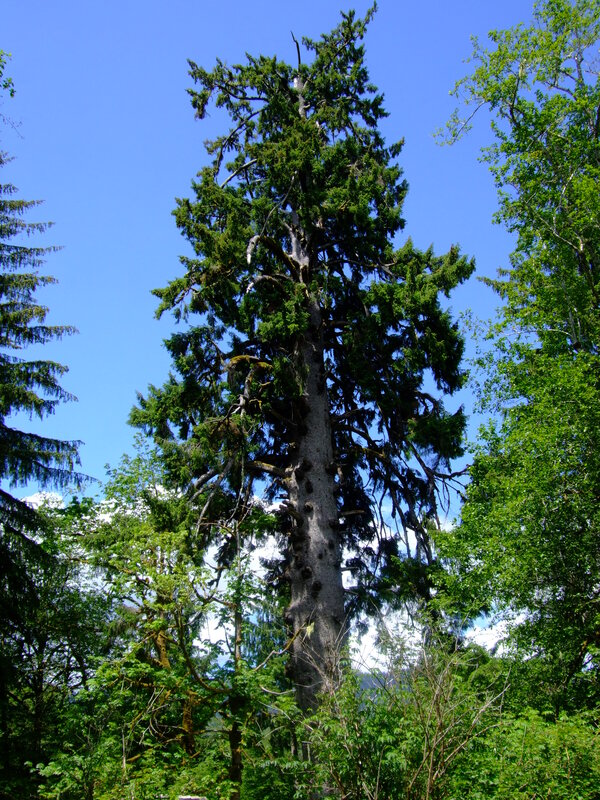 Growth: Sitka Spruce typically reach 180 to 225 feet (55-70m). The tallest are over 250 feet (75m) tall. The largest is at a resort on Lake Quinault and has a diameter greater than 17 feet (5m)! Most of the giants are found in Olympic National Park, Vancouver Island, and the northern Oregon Coast. The oldest are over 1300 years old. 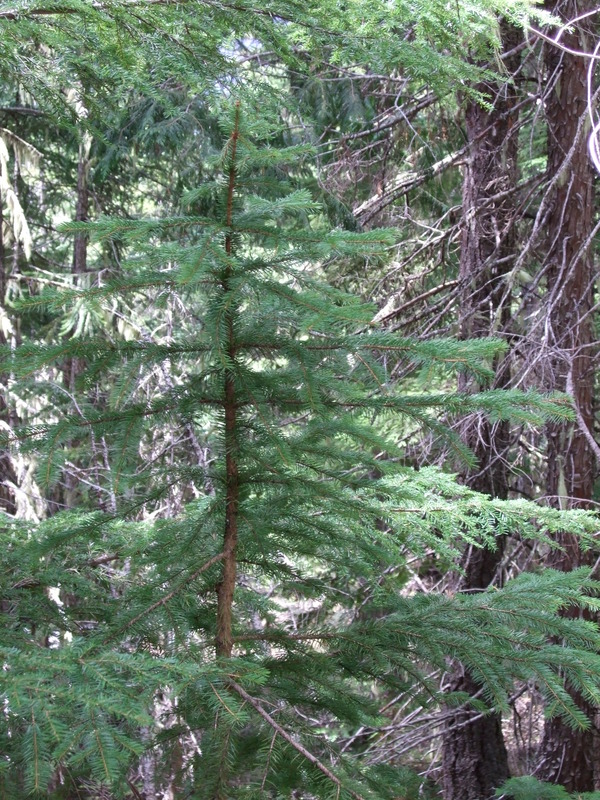 Habitat: Sitka Spruces often start their lives on nurse logs and can grow quickly when young. They grow best in moist, foggy rainforests where they can attain great size. 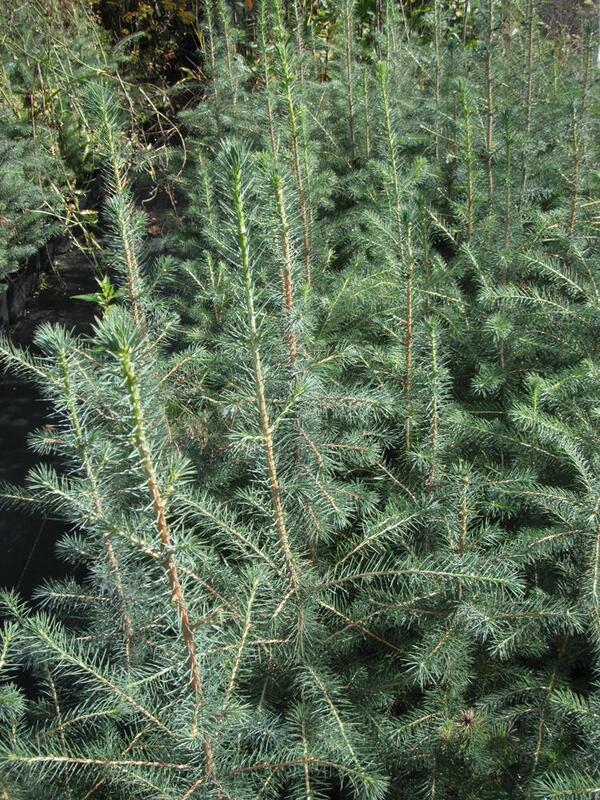 Diagnostic Characters: Most spruces are easy to identify due to their prickly, very sharp, needle-like leaves. It is true for Sitka Spruce as well. It hurts to grab a hold of a branch! The needles are light green or sometimes a silvery bluish-green. The cones are 1-3 inches (2.5- 7.5cm) long and are thin with wavy, irregularly toothed scales. In the landscape: It can be used as a large specimen tree. Phenology: Bloom Period: Late April-Early June. 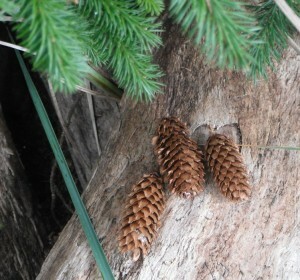 Cones mature in late August/ early September; seed dispersal begins in October. Propagation: Stored seeds should not be allowed to dry out. Seeds need no stratification and should be planted early in the spring on the surface of a mixed mineral/organic soil. Cuttings from current year’s growth, with a heel of older wood, is most successful when treated with 3000ppm IBA, and stuck into sand. Cuttings may be taken from June to October. Layering is also an option. 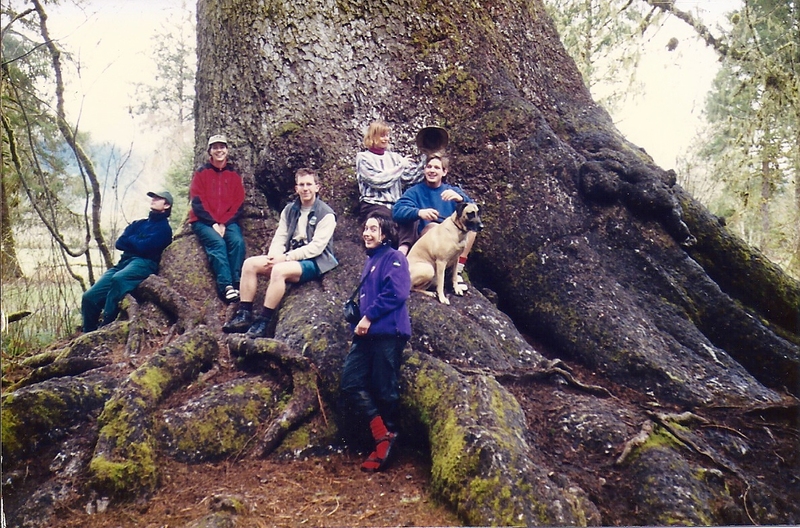 Use by People: The roots of Sitka Spruce were used by natives for basketry and hats. The pitch was chewed for pleasure and for caulking canoes. Many Sitka Spruce trees were felled during the early part of last century for the manufacture of airplanes and boats that were used during World Wars I & II. The wood is also valued for its resonant quality and is used in making pianos and guitars. Use by Wildlife: The foliage and twigs of spruce are browsed by grouse, rabbits and deer. The seeds are a valuable food for various birds, squirrels and chipmunks. The trees provide excellent nesting, roosting and winter cover. **Note it is best to avoid planting the Colorado Spruce, Picea pungens, in the Pacific Northwest. 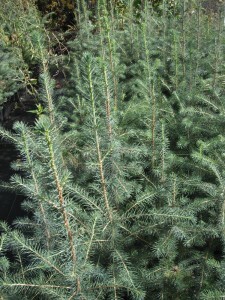 It is extremely susceptible to spruce aphids or adelgids, which cause it to loose its older needles. Sitka Spruce or White Fir, Abies concolor, are a much better choices if you want a tree with bluish or silvery foliage. This entry was posted in Conifers on February 10, 2014 by habitatdana.